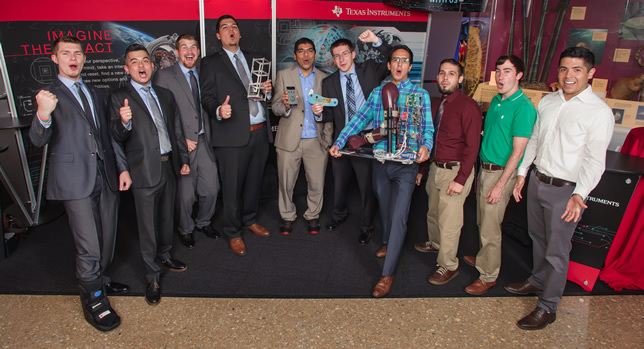 Three teams of engineering students created solutions to challenges involving medicine, space and health to win top honors in the Texas Instruments (TI) Innovation Challenge Design Contest. Texas A&M students won first place for creating a prototype of a space communication system that can be used to conduct low-Earth orbit research. The three teams were tasked with using Texas Instruments technology to come up with their solutions. Nearly 180 teams competed in the contest and the three winners presented their projects to TI executives and judges July 19. First place went to a team from Texas A&M University that created a prototype of a space communication system that can be used to conduct low-Earth orbit research. The team received $10,000 to be applied to furthering their designs or their academic pursuits. Another team from Texas A&M won second place for creating a brace-like device using an ultra-low-power microcontroller to stabilize, limit and assist elbow movements to restore upper arm function to people who have suffered injuries or disorders. The second-place team received a $7,500 prize. Finally, a team from the University of Alabama designed a device that uses Bluetooth technology to wirelessly monitor a person's physical activity through the insole of their shoes. They received $5,000. Best semester project: University of Texas at Austin. "When students marry engineering education with hands-on creativity, they have the potential to turn their innovative prototypes into the next big technology that will change the world," said TI Education Technology President Peter Balyta. The winners received their awards July 19 at a dinner held at the Perot Museum of Nature and Science in Dallas after earlier in the day touring a TI innovation center and presenting their projects to the judges.